Audio Pro International’s focus on the best of the industry’s up-and-coming audio technicians continues this week with the latest addition to our Rising Stars section. 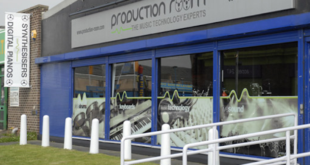 I studied Music Technology at BTEC level at NCN Clarendon in Nottingham. Afterwards I chose to go down the route of getting a lot of hands on experience volunteering rather than pursuing a degree in sound. With so much practical front of house experience the transition to going freelance was pretty smooth. I also started to volunteer at my church and immediately found that musically and technically the standard was very high. The ethos of doing everything with excellence really rubbed off on me and still affects my work every day. Which project are you currently working on? I’m currently working for a few of PA hire and event production companies in the Midlands including ESS and On. I also work for local venues in Nottingham on an ad-hoc basis. I’m based in Nottingham and the surrounding Midlands, I’ve travelled a bit for work but really love it here. Which audio console are you currently using? I seemed to have used a lot of Yamaha desks – all the way from the LS9 to the M7 and PM5D. I think they’re great consoles and are really functional to use. I use the Avid Profile quite a bit and even though its learning curve isn’t as quick as the Yamaha desks, I think the preamp sound quality is hard to contend with. Coupled with its flexibility and Pro Tools capabilities, I think it’s a great desk. Usually I’m mixing anywhere from 16-48 channels. What decision process was behind the choice of these consoles? Speaking to decision makers at the companies I work for, Yamaha was an obvious choice for them because of their ease of use and growing reputation as an industry standard. Most engineers (myself included) are totally comfortable rocking up to a Yamaha at very short notice. Apart from graphic EQ and speaker management I tend not to use much outboard apart from compression. Ringing rooms out is usually a must- especially for corporate or presentation work where I want to achieve absolute clarity and definition with good headroom. In terms of live music, I now tend to mix purely using mic positioning and subtractive mixing. If a room is meant to be mixed in and a system is set up well, I’ve found that’s all that’s needed. I think sometimes as engineers we tend to avoid that, because it’s an advanced technique- despite its simplicity. Any of Midas’ digital range, the Avid Venue or anything from Yamaha. I think the Midas desks combine the common sense workflow of Yamaha and the sound quality of the Venue desks. I think I’d really love to start doing some more venue work again with bands passing through on tour, possibly somewhere like an O2 Academy. There are three of them in the Midlands so who knows! If I was to work somewhere on a regular/ semi-regular basis I think I’d want to be working with some great people who are committed to good quality. I think currently there are a lot of artists in the charts who have a lot of artistic integrity to be respected. Maverick Sabre, Ben Howard and Emeli Sandé are all growing on me a lot. I’ve also been a fan of Coldplay and the Arctic Monkeys for some time now.